During the camera film era, Fujifilm battled kingpin Kodak with brighter, more vibrant colors that either photographers loved or hated—perhaps both. That was last century. In the 21st, Kodak is a shadow cast against aged Kodachrome, while its rival has successfully transitioned from print to digital—and with amazing bravado. Fuji’s transformation started six years ago with the cleverly-engineered, retro-designed X100, which I reviewed in May 2011. The compact digital camera’s success led Fuji to develop a series of additional bodies and lenses; all are designed with professional shooters in mind. The X series family features compact, mirrorless designs that incorporate digital SLR-size sensors and manual controls—meaning dials and buttons to directly manipulate settings rather than rely on software menus. The X100 line—from the original to the S, T, and now F—remains the most distinctive for how well features and benefits balance set against truly innovative design concepts. The new model, which released in mid-January—and is backordered most everywhere today—looks little different from its predecessors. But subtle refinements and faster responsiveness make the X100F classic. The retro-rangefinder styling draws attention, too. I get more comments about this camera than any other. Ever. And I started shooting digital in the 1990s. That said, like its predecessors, the compact isn’t for everyone. The lens is fixed, rather than interchangeable, at 28mm (35mm film equivalent). Then there is price: $1,299, which will put off budget buyers wanting more for less. Example: For Mother’s Day, Best Buy sells the Nikon D3400 dSLR with two lenses—18-55mm and 70-300mm—for $499.99. The kit is nowhere near as portable, but a whole lot more affordable. Looking for something smaller but powerful? Over at Amazon, the sleek Olympus OM-D E-M10 Mark II, with 14-42mm and 40-150mm lenses, sells for $599. Photographers looking for LCD touchscreen or water-sealed camera. Budget-minded shoppers who don’t mind lugging around a larger body and lens(es). Everyone who needs to use more than one lens or isn’t satisfied by 35mm film equivalent. Videographers wanting 4K; the X100F tops out at 1080P (continuous recording up to 14 minutes). Solely shoot a prime lens; you are the telephoto. Carry the coolest, classic design that isn’t a costly rangefinder. Use a compact camera with manual dials and dSLR-class sensor. 1. Retro design. Simply stated, this is one handsome camera that harkens back to 1950’s-era rangefinders. But looks are deceiving. The X100F is no rangefinder, and it has new, and innovative tech, inside. As previously mentioned, I get more passerby comments about this digicam than any other. Okay, excluding its three predecessors. 2. Amazing balance. In good design, balance is everything—and the X100F delivers in the two ways that matter: How the device feels/handles and the way features combine together. Physical balance is hugely important to digital cameras; more so for those to which large lenses are attached. But same applies to a compact, where buttons and dials are smaller and closer together. The main manual controls balance tremendously (more in Nos. 4, 6, and 8). 3. Compact size. The X100F is 126.5mm wide by 74.8mm high by 52.4mm deep and weighs 469 grams with battery—that’s 4.98 x 2.94 x 2.06 inches and 16.5 ounces. By comparison, the aforementioned Nikon D3400 is 124 x 98 x 75.5 mm and weighs 442 grams—that’s 4.9 x 3.9 x 3 inches and 15.6 ounces with battery, but without a lens. The 18-55mm adds 62.5 mm (2.4 inches) and brings combined weight to 645 grams (1 pound 6.8 ounces). The D3400 is considered to be a fairly svelte dSLR, but, particularly with lens attached, lumbers over the X100F, which is an easier carry-along camera offering many superior benefits. 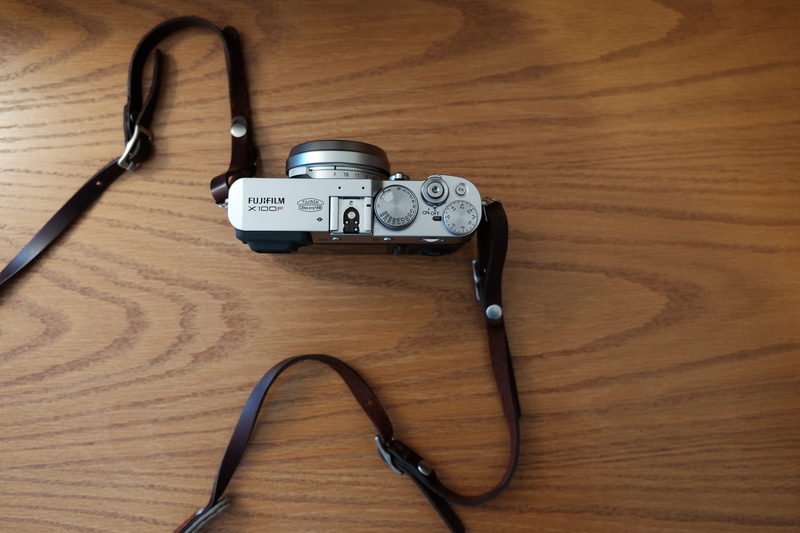 I attach the ONA Lima strap, which suits the Fuji’s size while augmenting its vintage style. 4. External controls. Fuji presents topside dedicated dials to change exposure compensation, ISO, and shutter speed—no fiddling with backside buttons or software menu required for the big four settings. Aperture adjusts around the lens. The vintage design ethic brings best of analog shooting to modern digital in practical fashion. 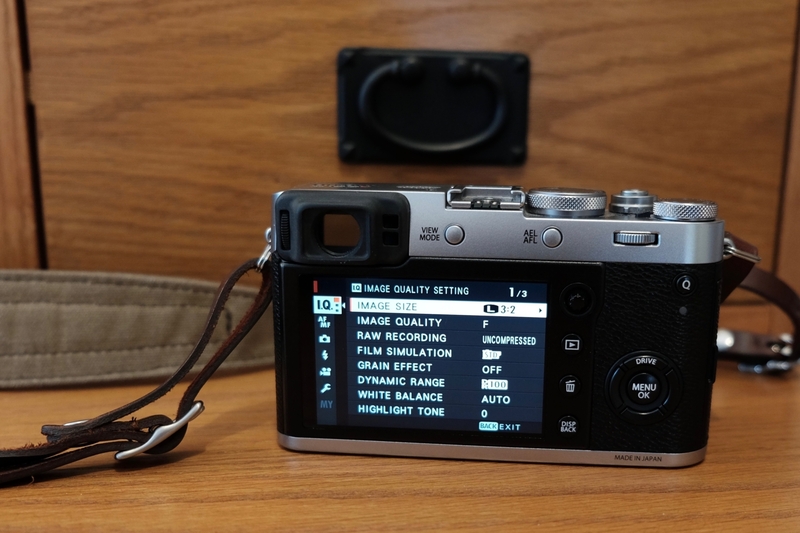 Like interchangeable-lens siblings X-Pro2 and X-T2, the X100F moves rear buttons to the right of the LCD screen, which is hugely convenient and truly enables practical, one-handed operation. And like the other cameras, the compact features an eight-position joystick for adjusting focal point. I tend to shoot almost everything off-center, and this new doohickey makes changing the point of focus super simple and fast. My one gripe: The Q (Quick Menu) button is too easily accidentally pushed when the camera is used one-handed. 5. APS-C sensor. The X100F packs a full dSLR-size sensor into a compact-size. However, this isn’t as big as the full-frame sensor (35mm equivalent) found on Leica rangefinders. The X-Trans CMOS III measures 23.6 x 15.6 mm and is the same sensor inside siblings X-Pro2 and X-T2. Meaning: Fuji didn’t skimp by providing something less. The X100F is capable of producing IQ—that is image quality—as good as the costlier cameras. All three output 24.3-megapixel images, which should be more than most anyone ever needs. 6. Fixed, f/2 lens. I’m a big fan of prime lenses, and you should be, too. A good fixed-lens will produce sharper images with less distortion than any telephoto. Fuji’s lens delivers—and it lets in a whole lot of light for people like me who don’t often use flash. At f/2, depth of field is super shallow and focus is soft, however. I find the effect appealing, but not everyone will agree. Interestingly, Fuji takes the “if it ain’t broke, don’t fix it” approach to the lens, which is the same as previous generation X100-family cameras. As previously mentioned, the aperture is set from a ring around the lens, in one-third steps from f/2 to f/16. Placement is super convenient and very tactile. 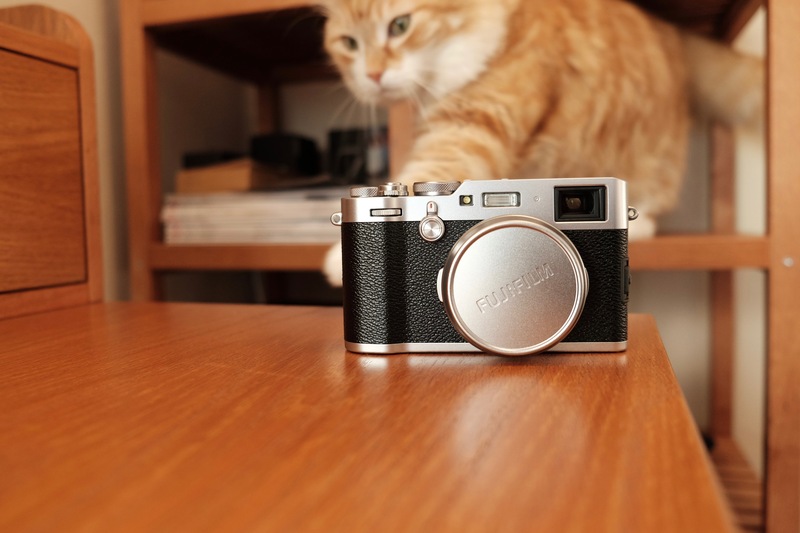 Auto-focus from the lens is adequately fast—a first for the X100 series. There natively are 91 focus points, which can be bumped up to 325. The camera can capture up to 8 frames per second before buffering is required. 7. Silent shutter. The fixed lens provides a unique opportunity: Place the shutter inside, rather than camera body. The leaf shutter is virtually silent and an additional electronic option is absolutely quite. Combined with the camera’s compact size and unobtrusive lens, the X100F is a discreet shooter, which makes it highly suited to street photography. Can you say paparazzi? The mechanical shutter is functional from 4 sec to 1/4000 sec and the electronic from 30 sec to 1/32000 sec. Both can be used in tandem. 8. Hybrid viewfinder. 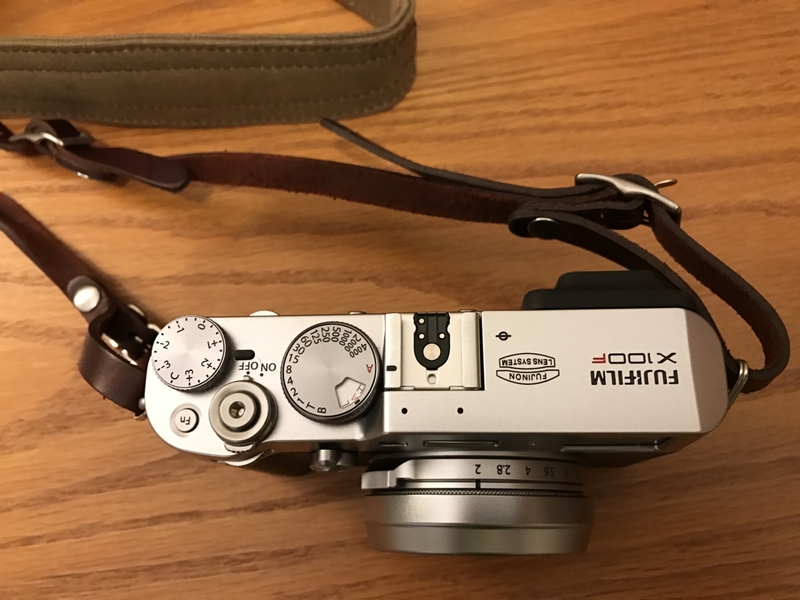 While the X100F has the typical LCD screen on the back, photographers are more likely to use it to view rather than to take photos. The X100F’s hybrid electronic/optical viewfinder is a marvel of innovation. Shooters can switch between both views, which offer simply shocking advantages for framing—that is composing—the picture. The concept, as executed, is uniquely Fuji and available on the X-Pro2, too. A conveniently-placed toggle switch on the front of the body, below the shutter, makes easy and fast the switching between EVF and OVF modes. Forefinger finds it easily. I prefer the optical viewfinder, mainly because it’s not obscured by bright San Diego sunlight and you see objects outside the frame; that’s a fantastic feature for anticipating the shot as people, animals, or things move into the photographic field. For the nitpickers, the X100F, like the T, conceptually provides a third viewfinder by offering an OVF-EVF combination. The optical viewfinder’s major drawback: The photographer doesn’t see a real-time preview of the image as it will be exposed. When the combo option is enabled, a small digital overlay appears in the lower-right of the viewfinder; problem solved. This feature is all but essential when operating the camera manually and looking through the OVF. 9. ND filter. The feature is unique to the X100F; it’s not available on either the X-Pro2 or X-T2. I find it to be incredibly helpful when taking photos in overly-sunny San Diego. With the ND filter on, the amount of light coming through the lens is cut by three stops, which makes possible shooting at f/2 in bright sunlight without overexposing the image. 10. Flash sync. The X100F can flash sync to a shutter speed of 1/4000 sec (at f/8). At f/2, with the ND filter on, it’s possible to capture portraits with the flash at shutter speeds up to 1/1000 sec, even in bright sunlight. I personally prefer to shoot without flash, but for those people who do, this is an outstanding capability to have—and marvelously unique. 11. High ISO. The X100F produces stunning images, even as high as ISO 12800, which is the max for standard operations (51200 is reachable when specially enabled). If you’re an indoor shooter—and I am when covering tech events—the high-ISO capability means capturing better photos without a flash. That makes the X100F more discreet and less intrusive, too. Again, can you say paparazzi? The F, for fourth, model in the series is the first with dedicated ISO dial, which is shared with the shutter and works like the X-Pro2. I honestly expected to find the mechanism to be clunky. But pulling up the nob to change ISO is preferable to the X-T2’s solely dedicated dial. 12. Fuji color. I end the benefits here to book-end the classic, vintage style, which applies to the images produced as much as the camera’s retro-design. Some photographers rave about the “Leica look” or “Foveon look” (for Sigma cameras). The “Fuji look” is very much about the warm colors and deep contrast the X100F produces. But there’s more: 15 film simulation modes that make the filters applied on Instagram or by some software programs appear as Crayola crayon scribblings. The X100F looks like a last-century film camera and can render images that deliver like one, too—not just color signatures but applied grain, if you like, too. Besides film simulation modes, Fuji also provides eight advanced filters for adding artistic flair to the photos. Like film simulations, these are applied in camera, rather than post-processing, and the results can be seen real-time when using the electronic viewfinder or rear-LCD screen. Around the InterWebs, X-Pro2, X-T2, and now X100F shooters rave about Acros black-and-white film simulation. Oh, and I agree. Carrying around this camera, turning nobs to taste and environmental conditions, and using Acros, you will feel like a rangefinder professional photographer of some bygone era (if by chance you aren’t one today). The blacks and greys produced are smooth and the contrast is crisp and rich. If B&W isn’t your thing, the X100F might make it be.